The aim of this study was to assess the potential effect of quercetin treatment on hyperuricemic renal dysfunctions and hemodynamic changes in in vivo and in vitro published studies. Data were obtained from Medline databases (PubMed, Medscape, ScienceDirect.) and all materials available in the internet from 2001 to 2016. The initial search presented 170 articles, of which 47 met the inclusion criteria. The articles studied the effect of quercetin treatment on hyperuricemic renal dysfunctions and hemodynamic changes. If the studies did not fulfill the inclusion criteria, they were excluded. Study quality assessment included whether ethical approval was gained, eligibility criteria specified, appropriate controls, adequate information, and defined assessment measures. Comparisons were made using structured review with the results tabulated. In total 47 potentially relevant publications were included. There was an association between hyperuricemia and renal function impairment together with deterioration of hemodynamic parameters. This association was due to hyperuricemic vascular endothelial dysfunction and oxidative stress. Studies concerned with quercetin treatment found that quercetin was able to improve hyperuricemic renal functions and hemodynamic parameter mainly due to its antioxidant effect. Quercetin treatment improved hyperuricemic renal dysfunctions and hemodynamic parameters. Uric acid (UA) is the end product of purine metabolism in humans. It is produced from hypoxanthine and xanthine through the action of the enzyme xanthine oxidase (XO). Hyperuricemia is likely a cause or exacerbating factor of hypertension and progressive kidney disease. Experimental studies demonstrated that experimental hyperuricemic hypertension is associated with inflammation, renal microvascular damage, and renal vasoconstriction. The mechanisms underlying the organ damage caused by UA are not completely understood, but many reports have indicated that endothelial dysfunction and oxidative stress play an important role in affecting cardiovascular and renal function. Allopurinol is the only XO inhibitor under the clinical application and has served as a dominant UA-lowering agent in the past four decades. However, some severe adverse effects such as hepatitis, nephropathy, and allergic reactions limit the clinical use of allopurinol. Therefore, the use of alternative approaches to lower UA has been suggested. Quercetin (3,3',4', 5, 7 pentahydroxy flavone) belongs to the family of flavonoids. It prevents the oxidation of low density lipoproteins. Some studies showed that it has a vascular protective effect against diabetes-induced vascular impairment, through the preservation of endothelium-derived nitric oxide (NO). The aim of this study was to assess the effect of quercetin treatment on hyperuricemic renal dysfunctions and hemodynamic changes and the underlying possible mechanisms. We reviewed papers on the effect of quercetin treatment on renal functions and hemodynamics in hyperuricemia from Medline databases (PubMed, Medscape, ScienceDirect) and also from materials available in the internet from 2001 to 2016. We used hyperuricemia/quercetin/hyperuricemic rats/renal dysfunction/endothelial dysfunction/antioxidant, and oxidative stress as searching terms. All studies were independently assessed for inclusion. They were included if they fulfilled the following criteria. If the studies did not fulfill the above criteria, they were excluded. The quality of all studies was assessed. Important factors included study design, attainment of ethical approval, evidence of a power calculation, specified eligibility criteria, appropriate controls, adequate information, and specified assessment measures. It was expected that confounding factors would be reported and controlled for and appropriate data analysis made in addition to an explanation of missing data. A structured systematic review was performed with the results tabulated. 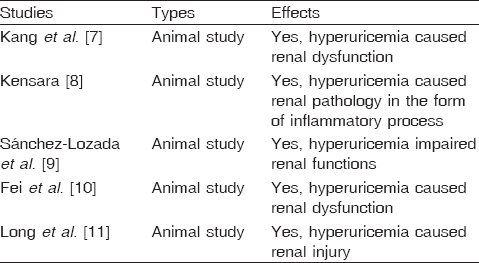 The effects of hyperuricemia on renal functions were investigated in five animal and 10 human studies [Figure 1]. All eight animal studies [Table 1] [7–11] investigating the effect of hyperuricemia on renal functions found that hyperuricemia affects renal functions in the form of elevation of serum urea and creatinine with reduction in glomerular filtration rate (GFR). 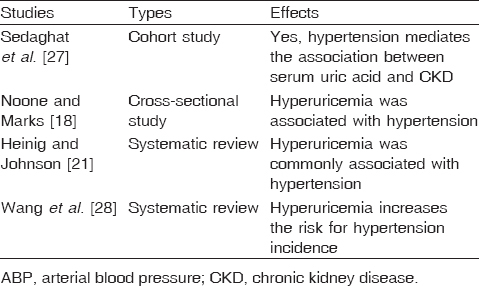 As regards human studies [Table 2] [12–21], they reported that hyperuricemia was associated with a decline in kidney functions. 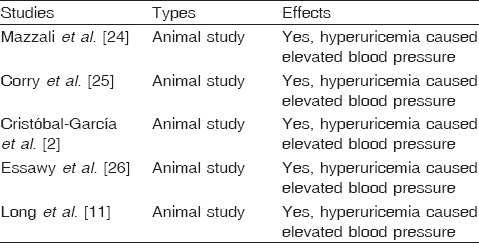 The effects of hyperuricemia on renal hemodynamics were investigated in three animal studies [Table 3] ,,. All of these studies found that hyperuricemia caused a reduction in renal blood flow and elevation in renal vascular resistance (RVR) including afferent and efferent arteriolar resistance. The effects of hyperuricemia on arterial blood pressure (ABP) were investigated in five animal and four human studies. They all showed elevation in ABP due to hyperuricemia. Animal studies [Table 4] ,,,, were performed on rats and identified that hyperuricemic rats had elevated blood pressure. As regards human studies [Table 5] ,,,, which included one cohort study, one cross-sectional study, and two systematic review, an association between hyperuricemia and hypertension was found. 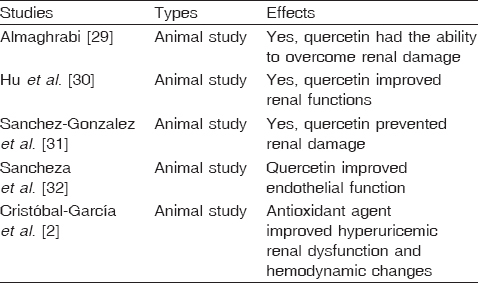 The effect of quercetin treatment on hyperuricemic renal dysfunction was investigated only in animal studies [Table 6]. There are three animal studies, which studied effect of quercetin on renal functions [29–31]. However, only one animal study studied the effect of quercetin on hemodynamic parameters and one animal study investigated the effect of antioxidant agent on renal function and hemodynamics together. All of these studies found that quercetin had a renoprotective effect. There are seven studies concerned with the effect of quercetin on ABP [Table 7] [33–39]. Only one of these studies was a systematic review. The remaining six studies were animal studies, which indicated that quercetin has the ability to reduce the elevated blood pressure. Hyperuricemia has been linked to cardiovascular and renal diseases, possibly through the generation of reactive oxygen species (ROS) and subsequent endothelial dysfunction. The enzymatic effect of XO is the production of ROS and UA. Studies have shown that inhibiting XO can reverse endothelial dysfunction. Elevated serum UA levels decrease the renal blood flow and the GFR as demonstrated by many studies. Kensara demonstrated that mild elevation in serum UA increased serum levels of creatinine and blood urea nitrogen with marked tubulointerstitial inflammation in the kidneys of hyperuricemic rats. Furthermore, Kang et al. studied the possibility of contribution of hyperuricemia in the progression of renal damage in the remnant kidney model. Rats developed hyperuricemia and showed greater proteinuria and higher serum creatinine compared with control rats. According to Fei et al., hyperuricemia was accompanied by an elevation in blood urea nitrogen and serum creatinine and decreased urinary creatinine indicating reduced urea and creatinine clearance. Moreover, the studies performed by Bellomo et al. and Sedaghat et al. showed that high levels of serum UA were associated with faster decline in eGFR and increased incidence of chronic kidney disease. Vascular and endothelial functions are known to have a major role in driving chronic kidney disease. The potential mechanism involves two-step process. The early mechanism as demonstrated by Sanchez-Lozada et al. was that hyperuricemia caused renal vasoconstriction mediated by endothelial dysfunction resulting from a reduction in endothelial levels of NO and activation of the renin angiotensin system. In addition, Mazzali et al. demonstrated that UA has some direct effects on endothelial and smooth muscle cells of the vascular wall, which ultimately lead to endothelial dysfunction and afferent renal arteriolopathy. Sánchez-Lozada et al. have found that afferent renal arteriolopathy could potentiate the renal injury by causing ischemia to the postglomerular circulation. The decrease in lumen also could provide a stimulus for the increase in renin expression, and also might contribute to the development of the marked hypertension. Furthermore, there is evidence that the arteriolopathy also leads to ineffective autoregulation and increased transmission of systemic pressures to the glomerulus, which also can potentiate renal damage. Antioxidant treatment successfully prevented the increment in blood pressure, intrarenal oxidative stress, and the renal hemodynamic alterations associated with increased levels of UA. El-Kotb and Galal also reported that the treatment of hyperuricemic rats with antioxidant caused a significant increase in renal blood flow and decreased RVR by its ability to scavenger ROS and thus improves renal circulation. Plant-derived substances with antioxidant activity such as quercetin prevented hyperuricemia by altering the expression and activity of various UA transporters. It has been shown that, in order to exert deleterious effects, UA depends on its intracellular concentration. In this context, the regulation of UA transporters is of great importance. Verzola et al. showed that URAT1 is fundamental for UA to enter into proximal tubular cells and induce intracellular oxidative stress. Direct hemodynamic effects of quercetin may also be invoked to explain its effect in the maintenance of GFR through the preservation of blood supply to the kidney. A possible explanation for the hemodynamic effects of quercetin is a reduction in RVR either through (i) a direct ROS scavenger effect and, particularly, to a diminished superoxide-driven NO inactivation or by (ii) potentiating the bioavailability and the biological activity of NO as a major regulatory factor of renal hemodynamics. Evidence exists to support several potential mechanisms whereby quercetin might decrease blood pressure and decrease the severity of hypertension in animals and humans. These mechanisms cause a decrease in oxidative stress, interfere with the renin–angiotensin–aldosterone system, and/or improve vascular function in an endothelium-dependent or endothelium-independent manner. Many studies found that a decrease in blood pressure in hypertensive animals and humans treated with quercetin is due to a decrease in oxidative stress. Yamamoto and Oue found that treatment of spontaneously hypertensive rats with quercetin improved endothelium-dependent vasorelaxation of aortic segments and decreased systolic blood pressure by 18%. Because indices of oxidative stress (e.g., urinary F2 isoprostane and plasma malondialdehyde) were lowered after quercetin treatment, the improvement in endothelial function was attributed to the antioxidant effect of quercetin. Moreover, quercetin has been shown to inhibit angiotensin-converting enzyme (ACE) in vitro, through its ability to chelate metal ions such as zinc. Häckl et al. demonstrated that both oral and intravenous administration of quercetin in Wistar rats attenuates the increase in blood pressure evoked by intravenous infusion of angiotensin-I. This study also reported a 31% decrease in ACE activity after quercetin treatment compared with baseline, suggesting that quercetin acted as an ACE inhibitor. Mackraj et al. provided another potential mechanism for the long-term blood pressure-lowering effects of quercetin through the downregulation of the angiotensin-I receptor in the kidney, increased urine volume, and increased urinary sodium excretion. Quercetin was also postulated to decrease blood pressure in rodents and was accompanied by improvements in endothelial function. For example, Duarte et al. reported that spontaneously hypertensive rats given 10 mg quercetin/kg body weight (through gavage) have improved endothelium-dependent vasorelaxation in isolated aorta and decreased blood pressure. Similar results have been found when quercetin is administered to rats with hypertension that is produced by NO synthase inhibition. Using a dietary model of hypertension (high-fat, high-sucrose diet for 4 weeks), Yamamoto and Oue observed hypertension, low aortic NO synthase activity, and low urinary NO metabolites, all of which were reversed by quercetin consumption. Collectively, these studies provide evidence that one potential mechanism through which quercetin can decrease blood pressure is through improved endothelial function evoked by increased NO bioavailability and/or NO production. Moreover, Sanchez-Gonzalez et al. postulated that improvement in endothelial function by quercetin was due to enhanced endothelial nitric oxide synthase activity and reduced activity of NADPH oxidase. They concluded that quercetin decreased vascular levels of O2, which might be due to its ability to scavenge ROS, regulate enzymes that generate free radicals, such as NADPH oxidase, and regulate antioxidant enzymes, including superoxide dismutase, which metabolize free radicals. Quercetin also might act directly on vascular smooth muscle (VSM). Perez-Vizcaino et al. reported that quercetin and isorhamnetin (quercetin metabolite) induced vasorelaxation of rat aortic rings similarly regardless of whether the endothelial layer of vessels was intact or denuded. Likewise, Rendig et al. found that the enhanced vasorelaxation in resistance and conductance rabbit vessels after quercetin treatment was independent of the presence of the endothelium. How quercetin acts on the VSM is not clear, but it has been speculated that vasodilation may result from inhibition of protein kinases involved in the Ca 2+ sensitizing mechanisms responsible for smooth muscle contraction. Quercetin treatment can improve renal functions in hyperuricemic patients due to its hypouricemic, antioxidant, and vascular protective effects. Gustafsson D, Unwin R. The pathophysiology of hyperuricaemia and its possible relationship to cardiovascular disease, morbidity and mortality. BMC Nephrol 2013; 14:164. Cristóbal-García M, García-Arroyo FE, Tapia E, et al. Renal oxidative stress induced by long-term hyperuricemia alters mitochondrial function and maintains systemic hypertension. Oxid Med Cell Longev 2015; 2015:535686. Sánchez-Lozada LG, Lanaspa-García M, Cristóbal-García M, et al. Uric acid-induced endothelial dysfunction is associated with mitochondrial changes and reduced intracellular ATP concentrations. Nephron Exp Nephrol 2012; 121:71–80. Haidari F, Keshavarz SA, Shahi MM, Mahboob SA, Rashidi MR. Effects of Parsley (Petroselinum crispum) and its flavonol constituents, kaempferol and quercetin, on serum uric acid levels, biomarkers of oxidative stress and liver xanthine oxidoreductase aactivity in oxonate-induced hyperuricemic rats. Iran J Pharm Res 2011; 10:811–819. Juraschek SP, Miller ER, Gelber AC. Effect of oral vitamin C supplementation on serum uric acid. A meta-analysis of randomized controlled trials. Arthritis Care Res (Hoboken) 2011; 63:1295–1306. Mahmoud MF, Hassan NA, El Bassossy HM, Fahmy A. Quercetin protects against diabetes-induced exaggerated vasoconstriction in rats: effect on low grade inflammation. PLoS One 2013; 8:63784. Kang DH, Nakagawa T, Feng L. A role for uric acid in the progression of renal disease. J Am Soc Nephrol 2002; 13:2888–2897. Kensara OA. Protective effect of vitamin C supplementation on oxonate-induced hyperuricemia and renal injury in rats. Int J Nutri Metabol 2013; 5:61–68. Sánchez-Lozada LG, Tapia E, Santamaría J. Mild hyperuricemia induces vasoconstriction and maintains glomerular hypertension in normal and remnant kidney rats, Kidney Int 2005; 67:237–247. Fei Y, Ye D, Fan X, Dong F. Effect of Dioscorea tokoro Makino extract on hyperuricemia in mice. Tropl J Pharmaceu Res 2016; 15:1883–1887. Long CL, Qin XC, Pan ZY, Chen K, Zhang YF, Cui WY, et al. Activation of ATP-sensitive potassium channels protects vascular endothelial cells from hypertension and renal injury induced by hyperuricemia. J Hypertens 2008; 26:2326–2338. Taalat KM, El-Sheikh AR. The effect of mild hyperuricaemia on urinary transforming growth factor beta and the progression of chronic kidney disease. Am J Nephrol 2007; 27:435–440. Bellomo G, Venanzi S, Verdura C, Saronio P, Esposito A, Timio M. Association of uric acid with change in kidney function in healthy normotensive individuals. Am J Kidney Dis 2010; 56:264–272. Iseki K, Ikemiya Y, Inoue T, Iseki C, Kinjo K, Takishita S. Significance of hyperuricaemia as a risk factor for developing ESRD in a screened cohort. Am J Kidney Dis 2004; 44:642–650. Weiner DE, Tighiouart H, Elsayed EF, Griffith JL, Salem DN, Levey AS. Uric acid and incident kidney disease in the community. J Am Soc Nephrol 2008; 19:1204–1211. Domrongkitchaiporn S, Sritara P, Kitiyakara C, Stitchantrakul W, Rittaphol V, Lolekha P, et al. Risk factors for development of decreased kidney function in a Southeast Asian population: a 12-year cohort study. J Am Soc Nephrol 2005; 16:791–799. Obermayr RP, Temml C, Gutjahr G, Knechtelsdorfer M, Oberbauer R, Klauser-Braun R. Elevated uric acid increases the risk for kidney disease. J Am Soc Nephrol 2008; 19:2407–2413. Noone DG, Marks SD. Hyperuricemia is associated with hypertension, obesity, and albuminuria in children with chronic kidney disease. J Pediatr 2013; 162:128–132. Nakagawa T, Mazzali M, Kang DH, Sanchez-Lozada LG, Herrara-Acosta J, Johnson RJ. Uric acid: a uremic toxin? Blood Purif 2006; 24:67–70. Lee JE, Kim YG, Choi YH, Huh W, Kim DJ, Oh HY. Serum uric acid is associated with microalbuminuria in prehypertension. Hypertens 2006; 47:962–967. Heinig M, Johnson RJ. Role of uric acid in hypertension, renal disease, and metabolic syndrome. Cleve Clin J Med 2006; 73:1059–1064. El-Kotb S, Galal R. The additive beneficial antioxidant effect of ozone therapy to xanthine oxidase inhibitor in experimentally-induced hyperuricemic rats med. J Cairo Univ 2014; 82:211–217. Sánchez-Lozada LG, Soto V, Tapia E, Avila-Casado C, Sautin YY, Nakagawa T. Role of oxidative stress in the renal abnormalities induced by experimental hyperuricemia. Am J Physiol Renal Physiol 2008; 295:F1134–F1141. Mazzali M, Kanellis J, Han L. Hyperuricemia induces a primary arteriolopathy in rats by a blood pressure-independent mechanism. Am J Physiol Renal Physiol 2002; 282:F991–F997. Corry DB, Eslami P, Yamamoto K, Nyby MD, Makino H, Tuck ML. Uric acid stimulates vascular smooth muscle cell proliferation and oxidative stress via the vascular renin-angiotensin system. J Hypertens 2008; 26:269–275. Essawy S, Khaled AS, El baz A. Comparing the effects of inorganic nitrate and allopurinol in renovascular complications of metabolic syndrome in rats: role of nitric oxide and uric acid. Acta Endocrino (Buc) 2012; VIII: 387–402. Sedaghat S, Hoorn EJ, van R. Serum uric acid and chronic kidney disease: the role of hypertension, PLoS One 2013; 8:11. 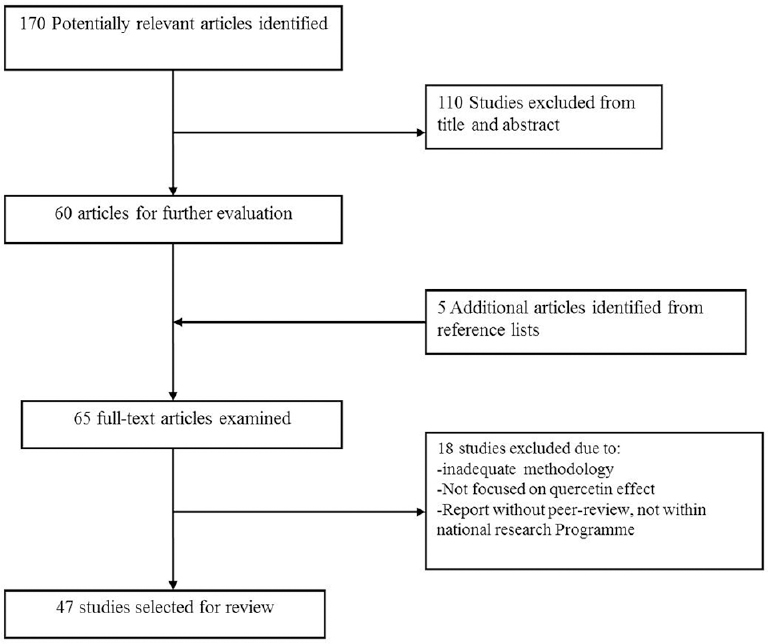 Wang J, Qin T, Chen J, Li Y, Wang L, Huang H, Li J. Hyperuricemia and risk of incident hypertension: a systematic review and meta-analysis of observational studies. PLoS One 2014; 9:e114259. Almaghrabi OA. Molecular and biochemical investigations on the effect of quercetin on oxidative stress induced by cisplatin in rat kidney. Saudi J Biol Sci. 2015; 22:227–231. Hu QH, Zhang X, Pan Y, Li YC, Kong LD. Allopurinol, quercetin and rutin ameliorate renal NLRP3 inflammasome activation and lipid accumulation in fructose-fed rats. Biochem Pharmacol 2012; 84:113–125. Sanchez-Gonzalez PD, Lopez-Hernandez FJ, Perez-Barriocanal F, Morales AI, Lopez-Novoa JM. Quercetin reduces cisplatin nephrotoxicity in rats without compromising its anti-tumour activity. Nephrol Dial Transplant 2011; 6:3484–3495. Sánchez M, Galisteo M, Vera R, Villar IC, Zarzuelo A, Tamargo J, et al. Quercetin downregulates NADPH oxidase, increases eNOS activity and prevents endothelial dysfunction in spontaneously hypertensive rats. J Hypertens 2006; 24:1. Serban MC, Sahebkar A, Zanchetti A, Mikhailidis DP, Howard G, Antal D, et al. Effects of quercetin on blood pressure: a systematic review and meta-analysis of randomized controlled trials. J Am Heart Associ 2016; 5:e002713. Yamamoto Y, Oue E. Antihypertensive effect of quercetin in rats fed with a high-fat high-sucrose diet. Biosci Biotechnol Biochem 2006; 70:933–939. Loizzo MR, Said A, Tundis R, et al. Inhibition of angiotensin converting enzyme (ACE) by flavonoids isolated from Ailanthus excelsa (Roxb) (Simaroubaceae). Phytother Res 2007; 21:32–36. Häckl LP, Cuttle G, Dovichi SS, Lima-Landman MT, Nicolau M. Inhibition of angiotensin-converting enzyme by quercetin alters the vascular response to bradykinin and angiotensin I. Pharmacol 2002; 65:182–186. Mackraj I, Govender T, Ramesar S. The antihypertensive effects of quercetin in a salt-sensitive model of hypertension. J Cardiovasc Pharmacol 2008; 51:239–245. Duarte J, Pérez-Palencia R, Vargas F, Angeles Ocete M, Pérez-Vizcaino F, Zarzuelo A. Antihypertensive effects of the flavonoid quercetin in spontaneously hypertensive rats. Br J Pharmacol 2001; 133:117–124. Duarte J, Jiménez R, O'valle F, Galisteo M, Pérez-Palencia R, Vargas F, et al. Protective effects of the flavonoid quercetin in chronic nitric oxide deficient rats. J Hypertens 2002; 20:1843–1854. Neogi T, George J, Rekhraj S, Struthers AD, Choi H, Terkeltaub RA. Are either or both hyperuricemia and xanthine oxidase directly toxic to the vasculature? Arthritis Rheum 2012; 64:327–338. Prasad Sah O, Qing YX. Associations between hyperuricemia and chronic kidney disease. A review. Nephro Urol Mon 2015; 7:e27233. Agarwal V, Hans N, Messerli FH. Effect of allopurinol on blood pressure: a systematic review and meta-analysis. J Clin Hypertens 2013; 15:435–442. Wang MX, Liu YL, Yang Y, Zhang DM, Kong LD. Nuciferine restores potassium oxonate-induced hyperuricemia and kidney inflammation in mice. Europ J Pharmacol 2015; 747:59–70. Verzola D, Ratto E, Villaggio B. Uric acid promotes apoptosis in human proximal tubule cells by oxidative stress and the activation of NADPH oxidase NOX 4. PLoS One 2014; 9:12. Abigail J, David S, Thunder J. Therapeutic potential of quercetin to decrease blood pressure: review of efficacy and mechanisms. Adv Nutr 2012; 3:39–46. Pérez-Vizcaıno F, Ibarra M, Cogolludo AL, Duarte J, Zaragozá-Arnáez F, Moreno L, et al. Endothelium-independent vasodilator effects of the flavonoid quercetin and its methylated metabolites in rat conductance and resistance arteries. J Pharmacol Exp Ther 2012; 302:66–72. Rendig SV, Symons DJ, Longhurst JC, Amsterdam EA. Effects of red wine, alcohol, and quercetin on coronary resistance and conductance arteries. J Cardiovasc Pharmacol 2011; 38:219–227.